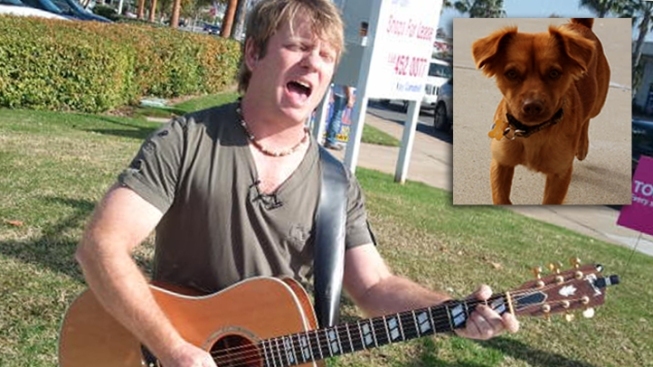 Guitarist Christopher Dale, 43, held a street-corner concert on Saturday for his missing dog "Redford." This weekend, a San Diego man is hoping that a series of street-corner concerts will be the key to finding his lost 2-year-old terrier. Christopher Dale, a 43-year-old guitarist, has scheduled two concerts for his dog “Redford" who went missing from a relative’s home on Dec. 15. “I was devastated basically. I just couldn't believe it, " Dale said of the loss. He added the incident was made even worse because his grandfather, who Dale was a caregiver to, had passed away around the same time. Dale was unable to do much about the lost dog as he took care of his grandfather’s affairs and now he’s making up for lost time with the concerts, he said. The idea for the street-corner shows came about when Dale thought up a way to add his musical spin to a similar event held by his friends in the past where they held signs on the street to raise money for a friend with cancer. Dale admitted too that heard of the woman dubbed simply the "Bikini Girl" who made headlines last year as she tried to find her dog dressed in nothing but a bathing suit. "I thought about hiring her," Dale joked. For his event on Saturday, Dale said he and his friends will pull inspiration from the likes of Tom Petty and John Mayer for a concert at the corner of Balboa and Genesee avenues. Sunday's concert was planned for the corner of Linda Vista Road and Genesee Avenue, though that location may change, according to Dale. Both shows start at noon. Dale is no amateur in music, having been nominated nine times in the San Diego Music awards. He also had had four solo albums. Beyond that, his music is heard on advertisements for Ikea, Nissan, Sparklett's and the former Henry's Marketplace -- now known as Sprouts. Dale was formerly known as Scorch and once fronted the San Diego band Grays Well.